Peterbilt presented its new 579 long haul truck at Mid-America Trucking Show in Louisville. The truck features a host of innovations and new technologies which make it more efficient and practical. The company says that this is the best truck Peterbilt has ever built. 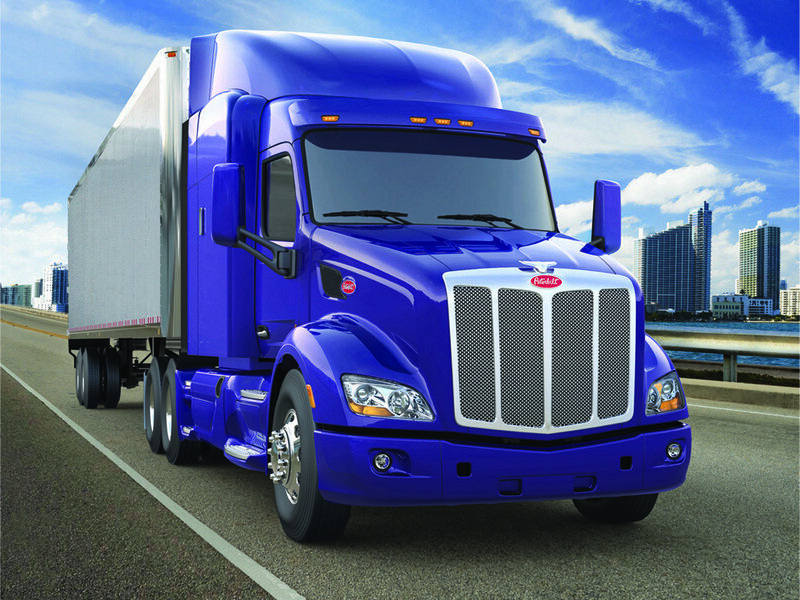 The new Peterbilt 579 is available with Single and Sleeper cabs and will start to roll off the assembling line in May 2012. The Peterbilt 579 features a modern and aerodynamic style with many distinctive lines typical for the company’s design language. There are numerous exterior elements designed to enhanced the aerodynamic performances of the truck, among them are the variable length chassis fairings, sleeper extenders and rubber flares, under-cab closeouts and under-fairing skirts. The front bumper was also designed to offer a low drag coefficient and uses a three-piece design so individual sections can be replaced if they are damaged, reducing costs of ownership. Similar with the bumper, the aero hood is also made of three pieces. In order to be easier to maneuver, the hood features the company’s tilt assist system that reduces lift effort with up to 25 pounds. The front is dominated by a massive chromed grille which features three vertical stripes. The grille gels well with the rest of the design, while the dynamic headlights are placed on the oversized front wheel arches enhancing the purposeful look of the truck. Once inside, you’ll find one of the best looking interiors in the segment. The materials are also pretty good compared with the rivals, while the cabin is offered with a catchy wood trim, which for the first time in a truck, it doesn’t look cheap. There are two cab trim levels available for the Peterbilt 579, namely the Platinum and Prestige. Platinum offers a luxurious and elegant interior with wood grain highlights throughout the cab and sleeper, while the Prestige offers a good balance between comfort and functionality. The controls are also elegantly organized and are easy to reach, while the all operating environment is designed around the driver with a high class ergonomy. The main instrumentation panel has easy-to-read gauges that are completely visible through the steering wheel. The instrument cluster is also fitted with a five-inch Driver Information Display nestled between the round gauges. The central display provides a new engine-RPM sweet-spot indicator to help drivers maximize fuel economy and also has the capability to display virtual gauges. The secondary gauge display area can accommodate six optional gauges or Peterbilt’s SmartNavTM driver infotainment center. To enhance the driving comfort, the standard steering column can be adjusted for both tilt and telescoping. Beside the standard 18 inch steering wheel Peterbilt also offers an optional four-spoke, leather-wrapped Premium Wheel with integrated audio and cruise control buttons. As most trucks in the segment the Peterbilt 579 is fitted with highly comfortable seats. The seats feature a wide cushion with optimized foam density and provide good lumbar support. The optional Evolution LX seats features two-chamber lumbar support, adjustable side bolsters, adjustable suspension dampening, heating and ventilation options, a swivel option and additional storage pockets. The road visibility is also very generous thanks to the huge panoramic windshield that is significantly thicker than previous designs offering improved noise insulation. The cab’s A-pillar design is 20-percent narrower than competitive designs, further improving visibility without sacrificing strength. The interior lighting is assured by LEDs which have a longer life and use less energy than the conventional lights. Both Single Cab and Sleeper Cab are heated and cooled by an automatic climate control system that maintains consistent, reliable HVAC performance. The Peterbilt 579 is offered with a choice of PACCAR MX or Cummins ISX15 engines. The Paccar engines develop between 380–485 hp with 1,450–1,750 lb-ft of torque, while the Cummins ISX15 output ranges from 400 to 600 hp with maximum torques between 1,450–2,050 lb-ft. The engines can be mated on either manual or automated Eaton transmissions with 9, 10, 13 or 18 Speeds, depending on the model. To further enhances performance and payloads capabilities, the Peterbilt 579 features a new chassis design that is lightweight, stiff and offers a better maneuverability while the relatively short turning radius and the ride and handling characteristics offer increased flexibility. The wheel cut was improved thanks to the angled gear installation, which offers better curb-to-curb turning than a conventional emplacement. The company says that despite the fact that the new chassis is significantly lighter than the previous units, the stiffness was increased by 10 to 15 percent. This big rig can be stopped using the standard front air-disc brakes and the Bendix Electronic Stability Control system. The Bendix ESP with Automatic Traction Control (ATC) works together with the Anti-lock Braking Systems (ABS) to maintain vehicle stability and help mitigate rollovers, jackknifing and loss-of-control situations by selectively applying brakes when excessive wheel slip or a critical stability threshold is compromised.